Learn how to care for your lawn in the winter. We are in the middle of winter, so you might think that you don’t have to care for your lawn until spring comes around. Well, in this case, you are wrong. It is critical to provide a little love and care to your lawn during the winter to ensure it is extremely healthy during the rest of the year. You want your lawn to be as healthy and as green as possible once March and April get here. 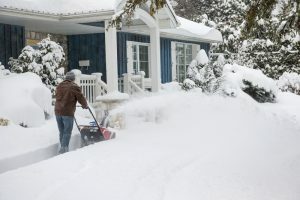 Luckily, there are few simple tips you should follow when caring for your lawn this winter. When caring for your lawn during the winter, it is essential to apply fertilizer so that the grass receives essential nutrients. The best time to fertilize your grass is when it is dry so that when snow falls, and it freezes, the nutrients will be locked into the soil. You only have to fertilize your soil on time throughout the winter. Once spring comes around, you will notice that your grass will be green and luscious. If you have any dead or damaged spots on your lawn, then overseeding is the perfect solution. Fertilizing will not do anything for dead grass so you need to overseed them so that you can produce new grass. Overseeding your lawn will aggressively attack the problem and produce a new section of your lawn in the spring. One of the most effective ways to care for your lawn during the winter is to aerate your grass which involves poking holes to give it some well-needed air. Aerating your lawn allows the soil to breathe and makes it easier to plant seeds during the spring. One of the easiest ways to aerate your lawn is to invest in a manual or motorized machine. If you have a large and spacious lawn, then a motorized aerator is probably the most effective option. This entry was posted on Friday, February 2nd, 2018 at 4:26 pm. Both comments and pings are currently closed.